This is so refreshing for long hot days out on the deck. My passion for food has very much extended itself to a passion for creating drinks. I adore making drinks that are served loaded with the fragrance of herbs and/or fruit. Nothing accompanies beautiful food more than a beautiful beverage. Don’t overlook the entirety of a food event, if you want to make an impression. I am not normally a sour or a cherry fan but when I spotted some sour cherry juice recently I had to try it. If unlike me you are a sour fan, you may wish to add less pure maple syrup and if you are after an even quicker recipe you could just add lemonade. I just prefer knowing how much sweetener I am drinking and also prefer pure maple syrup. Mix the sour cherry juice, maple syrup and soda water. Fill a glass ½ to ¾ with ice. 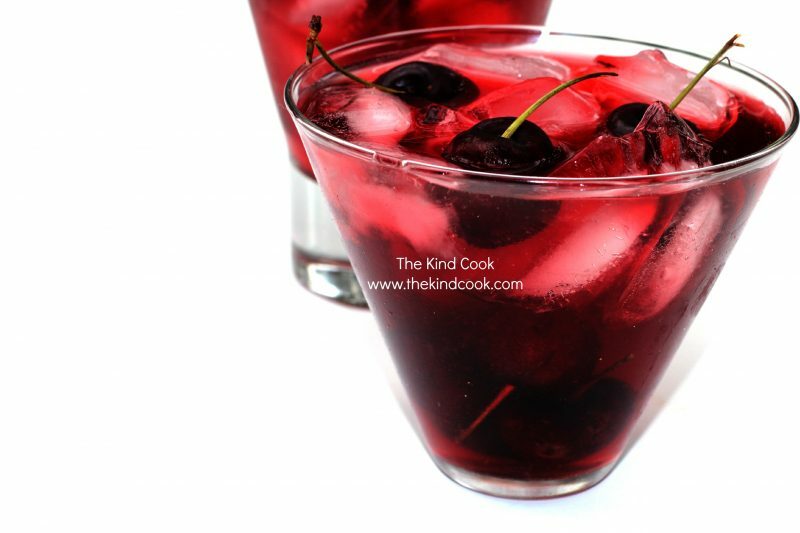 Pour in your cherry soda mix, Garnish with some fresh cherries and serve.